A must-read interview has just been published by Art Jewelry Forum: Manon van Kouswijk spent time talking with and exploring the collection of Canberra-based collectors Susan Taylor and Peter Jones. 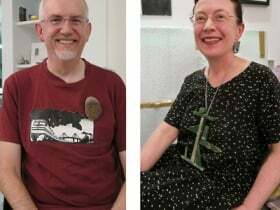 Susan and Peter have been collecting contemporary jewellery as well as contemporary art for many years, with an impressive level of engagement and thought. Read about their project here.